A reconstruction of the new short-armed and winged feathered dinosaur Zhenyuanlong suni from the Early Cretaceous (ca. 125 million years ago) of China is seen in this illustration image provided by the University of Edinburgh on July 15, 2015. Scientists have unearthed a spectacularly preserved, nearly complete fossil in northeastern China of a feathered dinosaur with wings like those of a bird, although they doubt the strange creature could fly. The researchers on Thursday said the fast-running meat-eater was about six feet (1.8 meters) long and covered with simple hair-like feathers over much of its body, with large, quill-like feathers on its wings and long tail. The largest-known dinosaur with wings, it lived about 125 million years ago during the Cretaceous Period. Considering its mouth full of sharp teeth and its overall oddness, University of Edinburgh paleontologist Steve Brusatte dubbed the dinosaur, named Zhenyuanlong suni, a "fluffy feathered poodle from hell." A member of a group of dinosaurs called raptors closely related to birds, it was a cousin of Velociraptor, although that dinosaur, featured inaccurately in the "Jurassic Park" films as much bigger than it was, lived about 40-50 million years later. 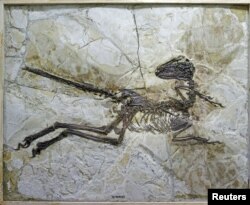 The preserved skeleton of the new short-armed and winged feathered dinosaur Zhenyuanlong suni from the Early Cretaceous (ca. 125 million years ago) of China is shown in this handout photo provided by the University of Edinburgh on July 15, 2015. "Zhenyuanlong was a dinosaur that really looked like a bird," said Brusatte, who collaborated with Chinese paleontologist Junchang Lu. "You wouldn't think of it differently than a turkey or an emu or a big chicken." In their form and shape, its wings looked like those of a modern bird like an eagle or vulture. "If you saw this wing on its own, you would probably think that Zhenyuanlong could fly. But it's a fairly big raptor, and its arms are so short in proportion to its body, that I have a hard time believing that it could fly or glide or do anything in the air," Brusatte said. More likely, Brusatte said, Zhenyuanlong used its wings for display the way a peacock uses its tail feathers to attract mates and intimidate rivals. Another possibility is using the wings to brood eggs in the nest, Brusatte said. Brusatte said finding a dinosaur with traits like Zhenyuanlong's raises questions about why wings evolved in the first place. "Did they evolve specifically for flight? In that case, Zhenyuanlong perhaps descended from a flying ancestor and that's why it still has wings. Or, alternatively, did wings first evolve for display or egg brooding or some other type of function, and then only in some dinosaurs were they later co-opted into airfoils for gliding and flying?" Birds evolved from small feathered dinosaurs. The oldest-known bird, crow-sized Archaeopteryx, lived about 150 million years ago.